When my son’s best friend decided to have a Lego party for his sixth birthday, I started designing a Lego cake for it as soon as I heard. My family even sat with me in support and didn’t call the psych ward as I sketched my ideas on a place mat at a restaurant at breakfast one morning. For the cake, I made two 9×13 sheet cakes, one chocolate and one vanilla, just because. I used the part I removed when I evened off the top, placed into a cookie sheet and covered with tons of green frosting to even it out, as the base. 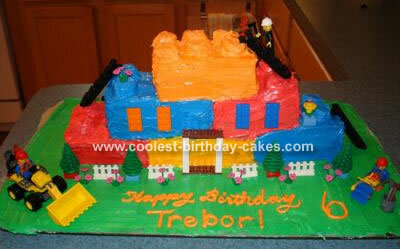 Then I created bricks by cutting the cakes into rectangles and pasting two rectangles together with frosting. (Note: I used more frosting than I have ever imagined on this cake). I placed the bricks in a pyramid pattern and then, after frosting first in white and then in color, I added mini Oreos and frosted them as the little interlocking thingies that make a Lego a Lego. After all the frosting was accomplished I added several small ($3-$5) Lego sets that my son had a blast putting together. There was a street sweeper, a quad racer, a couple of random parts, and a fireman. I also, at our local Lego store, bought a bucket of individual bricks, including several staircases, flowers, bushes, etc., and with these I changed my pyramid into a Lego low rise apartment building. I placed the fireman on the steps leading to the top, where he was heading to put out the candles. This was an incredibly fun cake to make. I even managed to get it to the party on time, in the rain, without dropping it or having it melt, and the birthday boy, family, and guests all loved it. This is a six year old’s reason for worshipping mom. Awesome! I think I have a budding architect or engineer on my hands. This will absolutely MAKE his birthday! He’ll be so excited!